While everyone seems focused on electrification through batteries and hybrids, commercial vehicles are moving instead to natural gas, a proven and cheaper green fuel. A boom of sorts is happening in natural gas, especially compressed natural gas (CNG) in the commercial transportation sector. 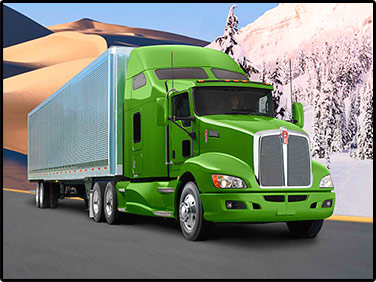 Most major truck manufacturers such as Kenworth, Peterbilt, Freightliner, Mack Trucks and others are utilizing engines that run on CNG in many of their models. These engines are providing safer, cleaner and lower-cost fuel needs while keeping performance standards. Major truck stops and fuel stops are incorporating natural gas into their fuel islands for the increasing number of vehicles using it and fleet vehicles in the light-, medium- and heavy-duty categories using natural gas are growing in numbers at a very high rate. Although diesel still dominates the fuel sector for commercial use, fleets large and small are turning to natural gas, especially CNG, as an alternative fuel source that is both cheap and plentiful as well as being much more emissions-friendly and cheaper to acquire than more expensive battery electric or hybrid drive trains. Waste Management, the nation's largest handler of refuse and owner of the largest fleet of garbage trucks in North America, has more than 1,400 CNG-powered trucks in operation now and is acquiring more trucks every month. The company is replacing 80% of its fleet with CNG options over the next several years and has also been busy building or leasing CNG fueling stations in key locations for its operators in the U.S. and Canada. They will have 50 of those stations by the end of this year alone. Their nearest competitor, Republic Services, currently has more than 20% of its fleet in natural gas and is also converting nearly all of its fleet to the fuel in the next few years. Many of those WM trucks are from Mack Truck, which introduced its TerraPro natural gas refuse truck in late 2010. That truck uses a popular natural gas engine, the Cummins Westport 9L ISL G, a 320 horsepower engine available for either CNG or liquefied natural gas (LNG). In either configuration it meets EPA 2010 requirements for emissions and is one of the first to do so. The company also produces the GX 2010 15L LNG, which also received 2010 EPA certification. Kenworth, part of the Paccar Group and one of the largest heavy truck makers in North America, has no less than three natural gas models, including the CNG-powered T440 and the LNG-using T800LNG. Pictured above is the T660, a truck body design which helped win the company the Environmental Protection Agency's Clean Air Excellence Award in 2011, making KW the first and only truck manufacturer to do so. The company is planning to offer natural gas options in all of its offered models in the next few years. KW competitor Freightliner, owned by Daimler Truck North America, delivered its 1,000 natural gas truck to a fleet in November. The company offers the 114SD CNG model and Business Class M12 CNG/LPG model, many of which have sold through its contract with Ryder Leasing in Anaheim, California. These are just a few examples. The Pilot and Flying J truck stop chains (now merged into Pilot-Flying J) are busy installing natural gas filling stations for both LNG and CNG at select truck stops nationally through an agreement with Clean Energy. The first installation was in Baytown, Texas in 2010. With 550 total travel centers and truck stops, Pilot-Flying J is the largest such chain in America. According to the Natural Gas Vehicles for America advocacy group, the use of natural gas as a transportation fuel nearly doubled from 2003 to 2009 and that there will be more than 50 million natural gas vehicles worldwide in the next decade, making up about 9% of the world's transport fleets. Currently, there are about 13 million worldwide, 112,000 of which are in the U.S. The October 2011 price for CNG, averaged, in the U.S. was $2.06 per gasoline gallon equivalent compared to $4.04 and $3.69 per gallon for diesel and regular gasoline (respectively). This gives fleet owners obvious incentive to switch to natural gas whenever possible. Fleets using natural gas in the U.S. are expected to double in size again in three years or less. While transit buses are currently the largest commercial user of natural gas use (62%), waste collection is the fastest-growing and may replace buses as the most-used NG vehicles in the next few years. Clearly fleets and transportation managers are looking towards natural gas as the optimal way for them to balance the need to lower fuel costs and emissions, increase use of domestic fuel sources, and maximize return on investment for the costs required to switch to an alternative fuel. The efforts by Clean Energy involve LNG and CNG, not LPG, which is propane. Thanks for pointing that out. I verified and fixed. I realize there are significant roadblocks (fuelling infrastructure, etc.) to applying this technology to the auto industry, but why are we not, at least hearing more conversation regarding the potential for this huge market? Given the over complicated, cost ineffective and limp roll-outs of current alternative fuel applications such as battery crossovers and bio fuels, It seems a no brainer. Why just commercial vehicles? Because people like you and everyone else who agree with you are not going to Ford, GMC, Chevrolet and Chrysler dealerships to DEMAND CNG vehicles. Put simply....American car manufacturers are in the business to make money. They only make vehicles that the public demands and wants. Speak out for CNG vehicles and they will come. Voices will be heard but people need to take action. I went to my local Ford dealership today to demand it and everyone should do this and it will happen. Honda Civic is being assembled in Indiana and shipped primarily to California. This one dealership in San Jose receives about 2 every month. CNG pumps are available and more are being added every day, especially at highway truck stops!!! See above of this article.